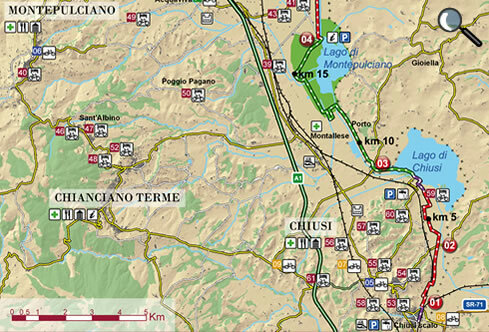 You begin cycling from Chiusi railway station, easily reaching the path’s start point. The route begins right where the embankment lies, built following the 1780 settlement between the Grand Duchy of Tuscany and the Papal State. The embankment marks the boundary between the Tuscan area of Chiana that descends towards the Arno River and the Roman Chiana area that leads towards the River Tevere. Nearby, towards the south, stands the impressive ‘Callone Pontificio’ (also named the ‘Campo alla Volta’) that used to regulate the entrance of the waters of the Chiusi lake flowing towards the River Tevere, before the embankment was built. Once having passed the hill of Chiusi, you soon reach the Torri [Towers] of Beccati Questo and Beccati Quello (or “Quest’altro”). The first one was built in 1427 by the Sienese in order to protect themselves from the expansionist aims of the inhabitants of Perugia, who immediately after, built the second tower. What is absolutely true is that even nowadays, these towers mark the boundary between Tuscany and Umbria and they both give the impression of defending their each and own lands…. 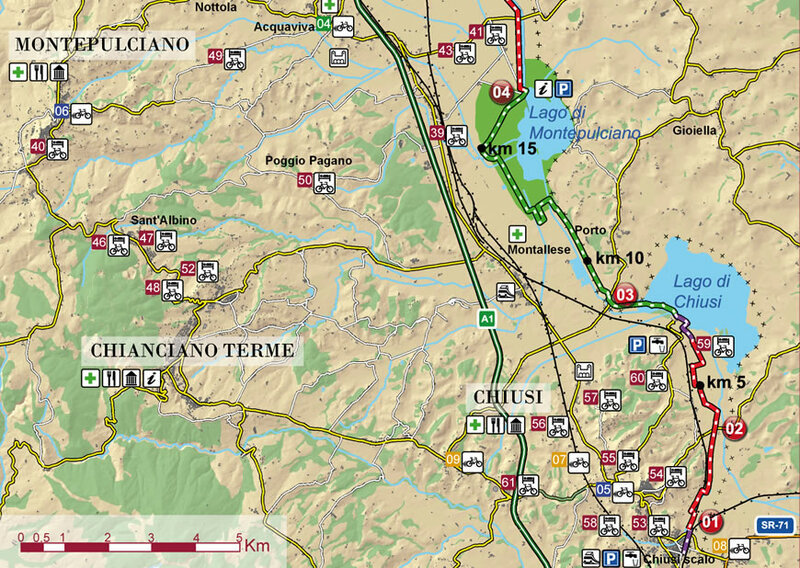 The first part of the journey takes you through valuable and important naturalistic environments, cycling in the heart of the green areas around the Lake of Chiusi and, immediately following, the Lake of Montepulciano, perfect places for delightful stopovers. These lakes are the ‘memory’ of the ancient marshes. The Lake of Chiusi is also where the legendary flight of Santa Mustiola took place: pursued and imprisoned by the emperor, she succeeded in reaching the lake by making a sort of boat out of her cloak that enabled her to float across the water. The legend goes on to say that every 3rd July, at night, you can see Santa Mustiola’s golden wake in the water. huts and platforms for bird watching as well as the chance to go for a boat ride over the lake.